Being a quilt designer with a home-based business makes it hard at times to make friends in the industry. 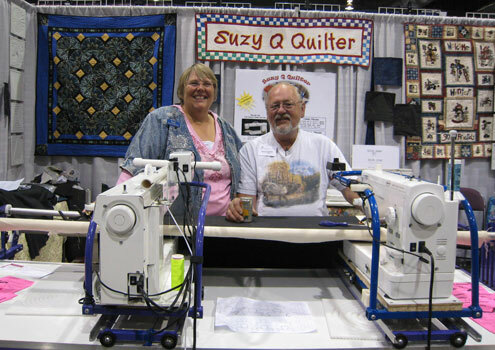 These are our friends, Sue and Art Capello, of the Suzy Q Quilter, a home machine quilting system that Art designed; and they personally manufacture. Sue and I met at a North Idaho quilt guild meeting about 4 years ago. She and Art started vending at quilt shows before we did, and were very helpful in getting us started on the show circuit. We support each other between shows with phone calls and emails, and have dinner at least one time per show. They just came to dinner at our home on Saturday night, and it was a fun evening! We talk shop a lot, but also our personal lives. Please click on the Suzy Q Quilter above to visit their website and view their quilting frames, and machine quilting templates. 2. Spread the can of pie filling evenly in the bottom of a 9″ x 13″ pan. Sprinkle the other cup of fruit on top (if desired). 3. Sprinkle the cake mix evenly on top of the fruit. 4. Pour the melted butter evenly on top of cake mix. 5. Sprinkle the nuts on top. 6. Bake for 40 – 45 minutes until golden brown. 7. Serve warm with Cool Whip or vanilla ice cream. Yum!